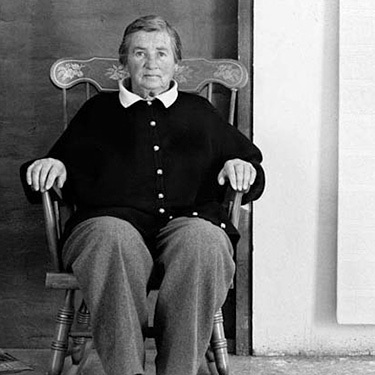 Agnes Martin’s paintings tread a soft boundary between Abstract Expressionism and Minimalism, and yet strictly speaking, they are something quite other. Martin’s works combine poetry and craft with an apparent regularity that has led to her being seen as a process-based artist. Her delicate yet judicious use of colour and her mastery of technique combined with a deeply poetic sensibility to result in works that manage to invoke the inscrutable language of mathematics and geometry, only to disrupt them, introducing a highly personalised sense of lyrical beauty. Her works are now held in a number of the most important museums in the world, including the Museum of Modern Art, New York, the Solomon R. Guggenheim Museum, New York and Tate, London. Martin was born in Canada but moved to the United States two decades later to attend Western Washington College of Education in Bellingham, Washington. Martin subsequently studied at Teachers College at Columbia University, then entered teaching. In addition, she travelled to New Mexico for a course, a step that would lead to her falling in love with the area, which would later become her home. In 1957, Martin became a part of the group of group associated with Coenties Slip, where she lived alongside, and in frequent contact with, artists such as Robert Indiana, Ellsworth Kelly, James Rosenquist and Jack Youngerman. These diverse contemporaries provided vital sounding boards for each other, creating a vibrant community there that served as an important support mechanism. It was against this backdrop that Martin began to garner success and recognition, being given a one-woman exhibition at the Betty Parsons Gallery the following year.